Would you like to add to your basket of fresh ingredients? Have you wished for a regular supply of natural-nutrients? Or wanted to grow your food but have limited space? 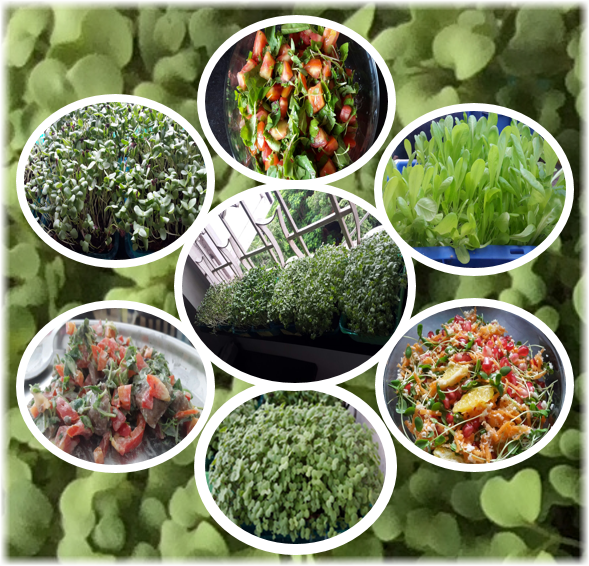 Nutrition Packed In Small Spaces - A Micro-Greens Workshop where you will learn the why , do the how-to-grow and savour the taste of micro-greens. You could also get to visit our urban farm before or after the workshop. 10 AM TO 12 PM. Rs. 600/- for normal registered participants. Rs. 500/- for registered patrons(donors). Please fill the form at the link given below to register for the workshop. Please ensure that you fill in your proper email address as further communication from us will be sent to this address. Payment can be made via Bank Transfer/NEFT, Cheque/Cash Deposit in Bank, Cash payment to a volunteer. Please visit a State Bank of Hyderabad branch to deposit your contribution into the "VIDYA VAARIDHI TRUST" account with details as given above. Select the state as Maharashtra and city as "Greater Bombay" or "Thane" for listing branches in Mumbai or Thane. Cash can be deposited with Urban Leaves volunteers located in various parts of Mumbai. Please select the desired location in the registration form. You will be emailed the details of the Urban Leaves volunteer to contact for depositing the contribution. For any questions please email: events [DOT] urbanleaves [ AT ] gmail [ DOT ] com.